Much has been written about guitarist Vuma Levin’s quintet album The Spectacle of An-Other (http://mp3dlfree.info/track/211575784/kayafm959-vuma-levin-quintet-live-on-taos ), and the leader himself has been articulate about its meaning and motivation. Recorded in Europe, with a group also including reedman Bernard van Rossum, pianist Xavi Torres Vincente, bassist Marco Zenini and drummer Jeroen Batterink, it’s an exploration of identity, transformation, hybridity and liminality. “These go hand in hand: nuancing African identity and empowering marginalized histories. It is a contradiction because on the one hand, you’re saying there’s no such thing as traditional African-ness, and on the other hand, there IS such a thing and we need to empower that. 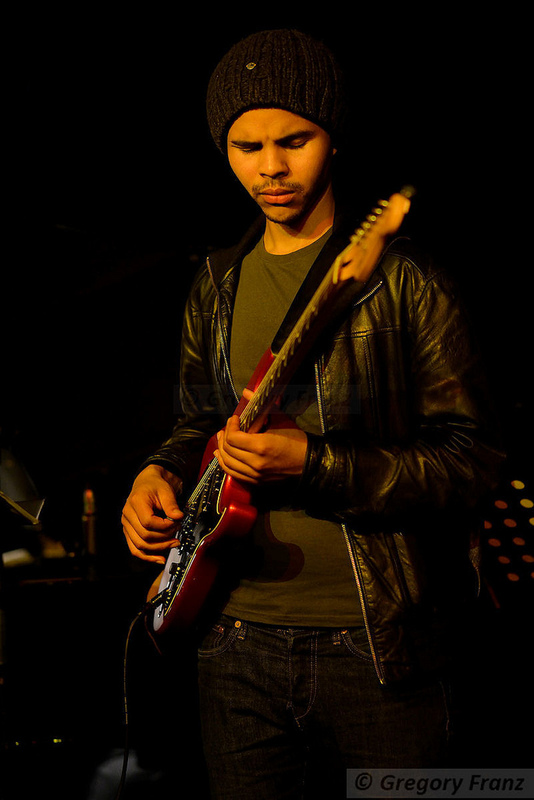 It’s a necessary contradiction to draw in…” he told Cape Town’s All Jazz Radio (http://www.alljazzradio.co.za/2015/07/06/an-interview-with-jazz-guitarist-vuma-ian-levin-about-necessary-contradictions/ ). The contradictions, he declares, were embodied in his experience long before they found their way into the music. Born in Swaziland to an exiled South African Jewish father and a Swazi mother, he grew up in a South Africa trying simultaneously to shake off the legacy of apartheid and grow a new, more inclusive identity: a complex, nuanced process full of recursions. His musical foundations were laid by his family’s catholic radio tastes, by Sacred Heart College; the National Youth Jazz Band; Johnny Fourie at the Tshwane University of Technology, and then conservatoire in the Netherlands. There, he encountered some of the kinds of expectations that inspired the album: that ‘revisiting his African-ness’ would neatly fit a set of almost pre-defined musical characteristics and presentations. All that, Levin expounds far more articulately than I can paraphrase, to say nothing of some analytical album sleeve notes from Lewis Gordon. But after the exegesis, what does the music sound like? It’s a gentle, thoughtful excursion, nothing like as intimidating as the verbal warm-up might suggest. That is where its cleverness lies – because Levin manages to deliver, low-key and unassuming, precisely what he promises . The second of eight tracks, On The Frontier, for example, opens on one of our most hard-fought geographical frontiers in the settler advance: the Eastern Cape, with a melody that might have been penned by Zim Ngqawana. That spatial fixedness doesn’t last. Van Rossum’s saxophone explores across and between other frontiers: modern jazz; European Art music – and modern South African jazz, which has for a long time now spoken a language that may be unexpected for European conservatoire professors. Given the music-education pedigree of the players, the calibre of the playing is unsurprisingly high. Perhaps less predictable is the fluidity with which the whole ensemble, with roots in various European countries, crosses communicative and headspace frontiers to work as a tight creative unit. That doesn’t always happen: the South African jazz idiom can harbour puzzles for newcomers. The late Joe Sample once told me how confused The Crusaders became when first working with Hugh Masekela, Jonas Gwangwa and Caiphus Semenya. In those apparently simple, catchy, almost pop tunes “at first, none of us could work out where one was!” he recalled. There’s one of those catchy numbers on Levin’s album too: In the Interregnum signals with popcorn guitar and classic I:IV:V chords that it intends to head into mbaqanga territory, before negotiating joyfully between the traded phrases of classic South African jazz, and some modal inspirations from otherwhere . And Levin is a generous leader: for the first four tracks we hear rather more of his bandmates than of his guitar, although his voice is always very present as composer. As a composer he has a neat musicological perspective on the history. By way of brief moments – a memory of a mood here; a taste of a texture there – he has crafted an album that references extensively the jazz lexicon developing in the ongoing process of our liberation: from the 1990s to now; from Rockey Street to The Orbit to..? The Spectacle of An-Other demands listening time, but rewards it too; with skilled playing and some truly lovely melodies (like the closer, For Feya) with an ear-worm-like capacity for insinuating themselves into your memory.